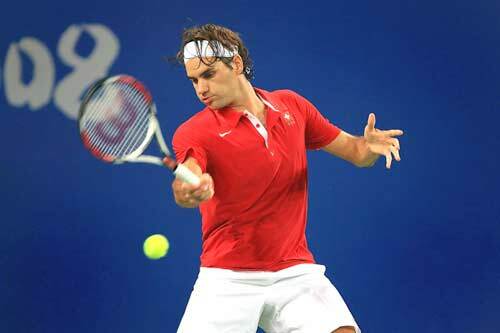 Tennis was included in the Olympic schedule from 1896 to 1924. Due to the persistence of then ITF President Philippe Chatrier and General Secretary David Gray, Tennis reemerged as a demonstration sport in the Los Angeles Games in 1984 and was officially reinstated as an Olympic sport in the Seoul Games in 1988. Tennis is played between two or four athletes. To score a point, Tennis players have to hit the ball with their rackets so that it lands on the opponent’s court without the opponent being able to hit it back. Winner is the athlete or pair to win three “sets” of six “games” each in the men’s events (best-of-five set match) and two “sets” in the women’s events (best-of-three set match). A Tennis contest is played between two or four athletes. An umpire, aided by nine line umpires presides over the contest. Before the beginning of the contest, the umpire flips a coin. The winning athlete or pair has the following options: choose its side of the court, choose to serve first, choose to receive first or give the choice to the opponent. Winner is the player or pair to win three “sets” in the men’s events (best-of-five set match) and two in the women’s events (best-of-three set match). To win a “set” an athlete or pair must win six “games”. Each “game” consists of four points. The first one is called 15, the second 30, the third 40. The fourth is simply the “game” ball: the athlete or pair wins the “game”, provided that there is a two-point difference. In case of a 40-40 tie (deuce), the athlete or pair must win two subsequent points (advantage, “game”). Similar rules apply to a “set”. For an athlete or pair to win a “set” they must be ahead by two “games” from the opponent. In case of a 6-6 “game” tie, there is a “tie break”: the athlete to serve first serves one “point” and then the athletes serve alternatively every two points, switching court sides every six points. The athlete or pair to score at least seven points while being in the lead by two points wins the “set”. A “tie break” can be played in all “sets” except for a contest’s last set at which an “advantage set” is played instead: winner is the athlete or team to win two subsequent “games”.